Only one game for you this week. It is also one we have seen before but like last week I decided to rewrite the article. Pig Out is a non-scrolling platform game. 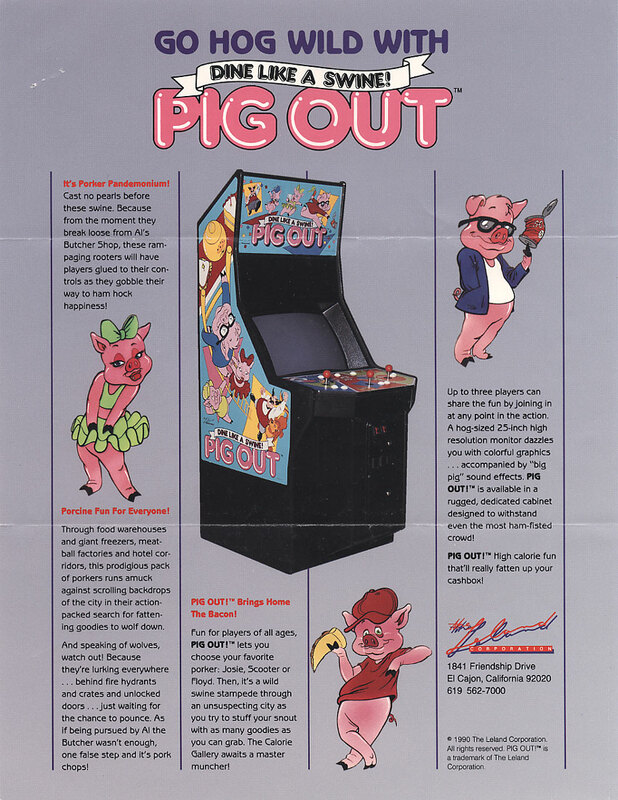 You play as one of three pigs, which has just escaped from Al's Butcher Shop. There are nine different pigs in total but only three different models, a boy wearing a baseball cap, a girl wearing a skirt and bow, and another boy wearing sunglasses. The blue player's character names are Buster, Starr and Oscar, the red player's character names are Scooter, Josie and Floyd, and the green player's character names are Horatio, Roxy and Stig. The differences between the character are purely cosmetic. The game has a total of twenty different maps ranging from stores, construction sites, caves and more. To complete a stage you must collect five jam jars, while also collecting food and other items for calories (points). You will need to do this while avoiding enemies such as Big Al, Wolf Packs and others. To help you avoid capture by your enemies, you will find items like cans, bowling balls and boomerangs, that can be thrown. You will also find power-ups to help you out such as, Coins, Umbrellas and chocolates just to name a few. After a few rounds you will find yourself in a bonus round. These bonus rounds are in the Breakout/Arkanoid style, where you must bounce on a platform inside a doughnut store to try and grab the food flying above you. The more you hit the platform the higher you bounce.